In an earlier post, I introduced a custom Apache Camel component that can be used to manage the OpenShift platform. It allows for the invocation of operations that control key components of the OpenShift lifecycle such as displaying user metrics and managing applications. The operations and metrics generated from this component can be used in a variety of applications that leverage the Camel framework to solve business goals. 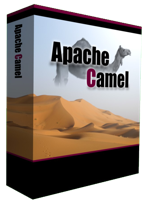 Camel can be deployed to a variety of runtime environments ranging from servlet containers such as Tomcat, application servers such as JBoss , OSGi containers such as Karaf, or even self sufficient as a standalone application. To demonstrate the functionality of the OpenShift Camel component in a project, we will leverage SwitchYard and JBoss as the running environment within a sample project called camel-openshift-switchyard. SwitchYard is a services delivery framework for running and managing service-oriented applications. By running on SwitchYard, it will allow for the opportunity to cover both the OpenShift Camel component and developing and running applications using Switchyard. This post will provide an overview to the sample project including the steps necessary to configure and deploy either in your own environment or on the OpenShift platform. In subsequent posts, we will review the project in depth including how Camel can be integrated into a SwitchYard project and how to integrate the OpenShift Camel component in a project of your own. Both services contain a RestEasy binding to allow for external invocation via REST. The OpenShiftApplicationsStatup service also contains a timer binding which will initiate the service at the top of each hour based on a cron schedule. To take advantage of the scheduled service operation, the following two system properties must be configured either within the application itself or on application platform. Included in the project are a series of integration tests designed to validate the functionality of the application and to demonstrate the testing capabilities of SwitchYard applications. Injection of property values and invocation of Services and HTTP resources are some of the components demonstrated. Prior to built or imported into an IDE, certain project dependencies must be configured. A core project dependency is the OpenShift Camel component which must be installed and available in the local Maven repository. Because this library is not part of any publicly available repository, initialization scripts for both Windows and Unix have been provided to configure the required dependencies. This script is found in the support folder of the project. Execute the init.sh or init.bat depending on your Operating System. The project has been configured to be seamlessly deployed to the OpenShift Platform. OpenShift provides the functionality to utilize custom cartridges which are not part of the core OpenShift platform to host applications. Since this project is built on SwitchYard, we will leverage a custom JBoss EAP 6 cartridge preconfigured with the SwitchYard runtime. The OpenShift Web interface provides the ability to specify a custom cartridge and existing source code during new application creation. However, due to the number of dependencies required by the SwitchYard platform, the project is unable to be built and deployed prior to the default application creation timeout. To get around this limitation, we will create the application using the OpenShift command line tools (RHC), merge the local OpenShift project with the camel-openshift-switchyard project hosted on GitHub, then finally push the application to OpenShift. Using the terminal in the location where the repository of the newly created application will be created on your local machine, issue the following command to create an application using the custom SwitchYard cartridge as the container. rhc app create <app-name> "http://cartridge-switchyard.rhcloud.com/manifest/466c7020661420c4604e870802fe673244861a5a"
You should be able to browse to the URL and utilize the application as you would on your local machine. As mentioned previously, we will walk through the project in detail in a future post. This will allow for the demonstration of SwitchYard components and provide examples of how the OpenShift Camel component can be used in projects of your own. Since its creation in 2007, the Apache Camel project has allowed developers to integrate systems by creating Service Oriented Architecture (SOA) applications using industry standard Enterprise Integration Patterns (EIP). At its core, Camel is a routing engine builder for which messages can be received and processed. The processing of messages uses a standardized API library backed by an extensive collection of components which abstracts the actual implementation of routing and transformation of messages. These components also include the ability to communicate with external systems through an array of protocols ranging from web services, REST and JMS. With more than 80 components in the standard Camel distribution, developers have the flexibility to perform power operations with minimal effort to suit their business needs. One of the benefits of the Camel component framework is that it was designed as a factory system where new components can be easily added to solve a business use case. As more companies and individuals look to migrate their operations and applications into cloud-based solutions, the management of these resources can prove to be a challenge. The overall architecture may be different than what many individuals are accustomed. The OpenShift Platform as a Service (PaaS) is one such cloud offering where developers can quickly create powerful scaled applications without having to worry about managing infrastructure or complex software installation. Imagine being able to communicate with the OpenShift Platform directly through a Camel route? With the OpenShift Camel component, it is now possible. 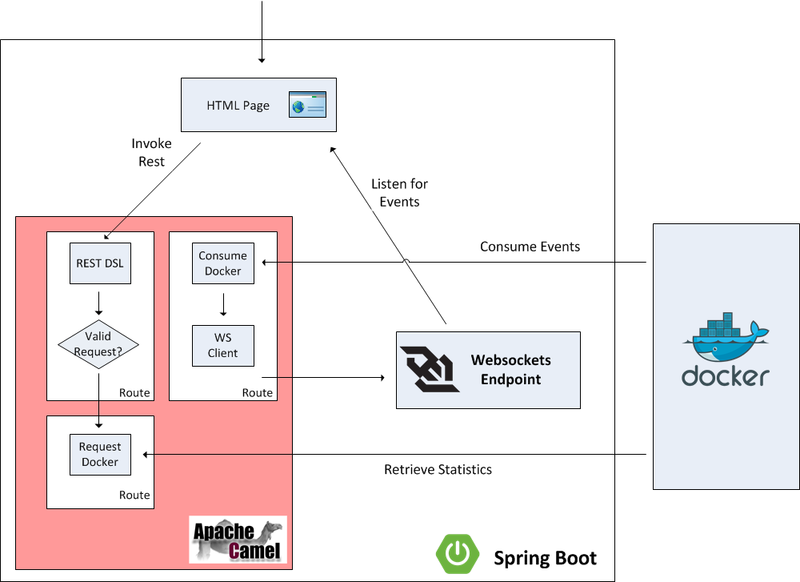 Exposed through an Endpoint as both a Camel Consumer and Producer, OpenShift resource details can be retrieved or modified all within a Camel route. Want to find out information about a particular OpenShift Domain, such as the applications and their details? How about automating application deployments? These are only some of the possibilities now available. Communication between the OpenShift Camel component and OpenShift is facilitated by using the REST API exposed by the OpenShift platform and the OpenShift Java Client. Responses from the OpenShift Camel component will be returned using the API from the OpenShift Java Client. The OpenShift Camel Component can be easily added to a new or existing project. The following steps will describe how this can be accomplished. Add the component to a new or existing Camel Project as a Maven dependency in the projects’ POM file. With the steps above complete, the project can be deployed to a running container or unit tests can be created to verify the expected results. Additional functionality including how to leverage Authentication as Message Headers can be found on the GitHub project page. 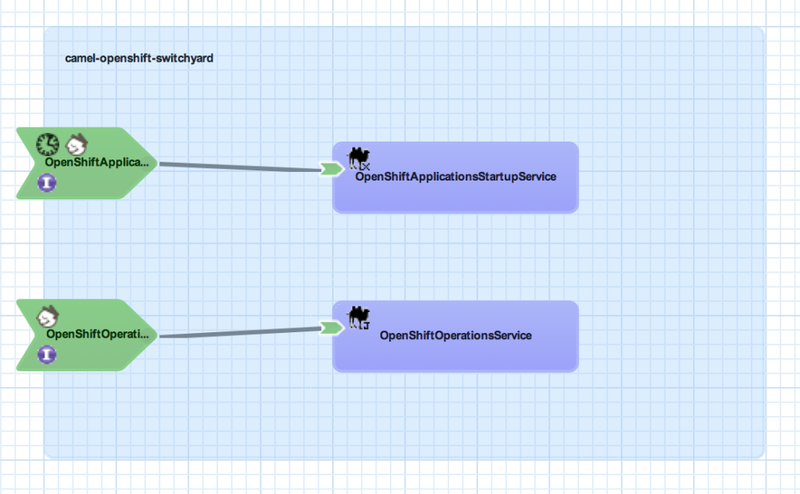 In an upcoming post, I will demonstrate several uses for the OpenShift Camel including how the component can be leveraged within a SwitchYard application.